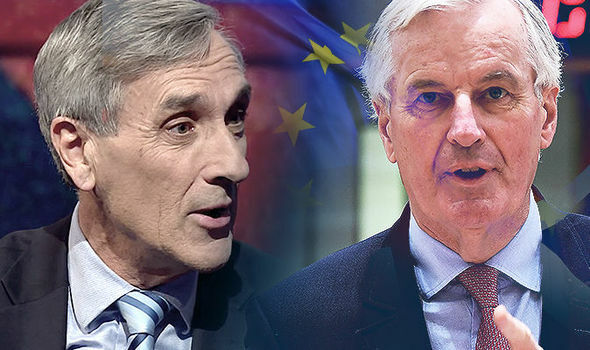 BREXITEER John Redwood has ripped into the European Union claiming the bloc have been “behaving in a sad way” during crucial Brexit negotiations. Conservative MP and leading Brexit supporter Mr Redwood criticised the European Union for the way they have used the Irish border in exit negotiations. The European Union has said it is up to Britain to come up with a solution over the Irish border and EU Council President Donald Tusk set the UK a deadline of June. Mr Redwood, however, argued the European Union were being deliberately difficult over the Irish border after rejecting the UK’s suggestions so far. He said: “The EU is, of course, playing politics with the Republic of Ireland and trying to make out there is some great difficulty with the Irish border which I and my colleagues just don’t see. “We don’t see the need to impose big physical barriers on the Irish border we will just carry on trading. “The EU are behaving against the interests of their member states in a rather sad way. They aren’t producing anything constructive. “Every time the UK makes a serious constructive proposal, they explain they are not things they can respond to. “Interesting enough there has been a public debate among the cabinet about looking at two different ways of leaving the customs union but enhancing our trade prospects but the EU seems to have ruled out both of those already. The Conservative MP was then asked about the internal debate in the cabinet about a potential customs partnership with the European Union. The Brexiteer swiftly told LBC: “There may be 10 MPs who don’t like Brexit at all and are trying to find ways of working with the opposition and with the European Union to dilute what would be a straightforward Brexit that the public voted for. It comes after pro-Brexit Conservative MPs warned the Prime Minister about keeping Britain in the customs union after Brexit. Last month the House of Lords defeated a Government amendment which leaves the door open to the UK remaining in the customs union after Brexit. Staying in the EU arrangement would effectively decimate the UK’s chances of striking post-Brexit trade deals with countries like the US and Australia. The Prime Minister delivered a passionate message during her article in the Sun on Sunday where she insisted the UK would be leaving the EU’s single market and customs union. Mrs May said she had an “absolute determination to make a success of Brexit, by leaving the single market and customs union and building a new relationship with EU partners that takes back control of our borders, our laws and our money”. She also emphasised the UK was “making good progress towards that goal and we will carry on doing so with resolution in the months ahead”. A decision on the Government’s ideal customs option has been postponed after the Prime Minister’s Brexit “war cabinet” failed to reach an agreement last week.